Rallying is a breathtaking - when you actually see the speeds achieved on the daunting terrains, it really does make you appreciate the awesome skill of the drivers. It can be difficult to access some of the best vantage points but in recent times, the improved organisation, helicopter travel and the growth of on-site hospitality make it a very viable motor sport option. The World Rally Championship (WRC) has always been one of the most demanding and challenging motor sport disciplines. There are already millions of fans hooked to World Rally - spellbound by the world's greatest drivers doing battle in some of the harshest environments in the world. The World Rally Championship is the world's biggest live spectator sports and offers a real buzz watching the event live. The whole atmosphere is informal and fun - and there is great viewing access, standing only feet away from the cars. As befitting our name, we specialise in being in the right place and viewing the finest motorsport possible. We also specialise in offering only the finest events on the motorsport calendar. The Monaco Rally is one of the jewls in the crown and we provide access to rally stages that are considered to offer some of the finest in rally spectating. Rallye Monte-Carlo is the oldest in the calendar; first run in 1911, it was designed to promote Monte-Carlo as a tourist destination, with competitors starting from different European cities before gathering in Monaco. The 1966 rally became famed for its controversial outcome when giant-killing Mini Coopers claimed the top three places before being disqualified for alleged infringements of headlight regulations. Essentially an asphalt rally but unpredictable mountain weather brings varied conditions. 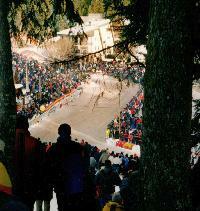 Competitors must expect snow, ice and dry asphalt - often encountering all in the same stage. They must balance the need for grip in winter weather with that required for dry asphalt. Shrewd tyre selection providing the best compromise for frequently changing conditions is key. Experience and the ability to 'read' conditions is vital. ? The official start for 88th Rallye Automobile Monte-Carlo is scheduled for Thursday January 24, Casino?Square in Monaco, from 5:50 pm onwards. During the first nightly leg, a couple of interesting special stages will be organized in the department of Alpes-de-Haute-Provence: Thoard ? Sisteron (SS1 ?? 36,69km ? 9:43pm), raced in that direction for the very first time in WRC, will be followed by Bayons ? Br?ziers (SS2 ?? 25,49km ? 10:51pm), already used in 2017 & 2018. Saturday January 26, north of Gap, will be just as tough as the previous days, with special stages based in the departments of Is?re and Hautes-Alpes, and a double loop to start with, consisting of Agni?res-en-D?voluy ? Corps (SS9/11 ? 29,16km ? 08:08am / 11:57am) followed by Saint-L?ger-les-M?l?zes ? La B?tie-Neuve (SS10/12 ? 16,87km ? 9:16am / 1:08pm). However, this 3rd day will not be over since the crews will be back, by daylight, in the same Bayons?? Br?ziers (SS13 ? 25,49km ? 4:09pm) stage as Thursday night, and then they will stop one last time at Gap Service Park before they drive back to Principaut? de Monaco in the evening. The conclusion of the rally, on Sunday January 27, will be made of four special stages (63.72km) with no chance of going through a Service Park in the steep hills of Alpes-Maritimes. So the drivers will go twice through La Boll?ne-V?subie ? Pe?ra-Cava (SS14/16 ? 18,41km ? 8:32am / 10:55am) and La Cabanette ? Col de Braus (SS15/17 ? 13,58km ? 9:08am / 12:18pm) which will be used as a Power Stage at the end of the second loop. At 3pm, all deserving crews will be welcomed and honoured at the ritual Prize Giving Ceremony in front of Monaco Prince's Palace. We only use helicopters to access the stages on the Friday, Saturday and Sunday. We fly out of Monte Carlo and soar into the snow covered mountains and land within walking distance of each stage. Lunch and subsistance is also included in the package.